We’ve got some nice cycling weather going on here in Arizona now. Pretty cold in the morning at start time (currently 9am, just moved back from 10am), but fabulous three hours later when we’re wrapping up. How cold is it in the morning? 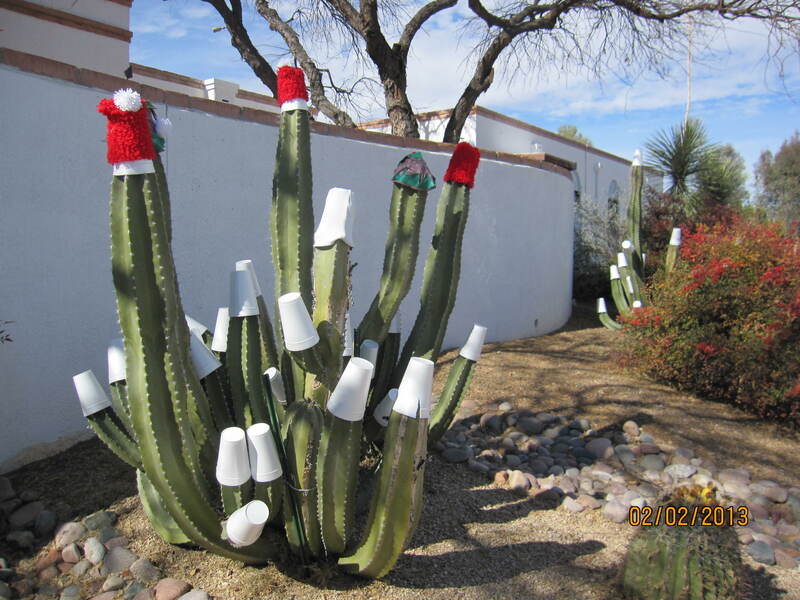 Even the cactus need cold weather gear around here. Specially knitted hats & styrofoam cups. Today’s ride took us up Elephant Head (a difficult climbing mountain) to the Whipple Observatory (think astronomy) Visitor Center, a 43 mile round-trip. Great ride, except for the final 8-mile climb to get to the Visitor Center. Of course, they’re not going to put telescopes on the ground….but man, that is one long climb. The descent rocks! One final note – our neighbor here is Canadian. He showed us some of the new bills Canada has ‘printed’. He had a $100 bill, and it’s made of plastic, with some transparent panels with maple leafs imprinted on them. The maple leafs smell like maple syrup!! Unbelievable. Wonder what they’ll smell like in 10 years?? This entry was posted in cycling, retirement, T@DA and tagged Arizona, cycling by Judy Crankshaw. Bookmark the permalink. Money that smells like Maple Syrup?� Whoa!� What a�sneaky way to tempt people to buy a pure Canadian product!��� Sounds like you’re having a great time. Isn’t retirement great!